My mother is a post-partum nurse. When I was a kid, having a mom as a nurse was pretty nice in that she always took care of my “boo boos” and I grew accustomed to a never-ending supply of pharmacy-type items (bandaids, alcohol wipes, ibuprofen, etc) in our hallway closet. My mother always shopped in fear that if there was ever a pain or ache she would not have the remedy for it. There are hazards that come with her job though. Hazards for a now thirty year old me. My mother basically works with mothers and their babies. All the time. It’s not just a little reminder that she doesn’t have grandchildren yet, but a giant, hey, let’s rub it in your face for an eight hour shift Monday through Friday, and then maybe sometimes on weekends. At first I didn’t put any weight in the way my mom commented about how cute other people’s infants were at random places like the mall, because she has always loved babies. It was when I was approaching my 29th birthday that I realized she was actually starting to panic that she may never have grandchildren. I didn’t get my eggs frozen. Like a tea strainer and a drain strainer. Both, my friends said (in case you can’t connect the dots), seemed all too similar to the shape of a uterus. I still haven’t frozen my eggs. I was happy that we were able to talk about dishes she used to make when I was younger. Recipes that reminded me of home, when I lived there, wasn’t thirty and didn’t have the pressures of having a basketball sized belly from my mother (and Facebook). While I can never promise my mother grandchildren, I can pay her a little honor by remaking her lemon and ginger soba noodles with pan fried spicy tofu. While she didn’t give me specific measurements (my mother and Rachael Ray are kindred spirits, they never measure a thing while they cook), I used what she told me she threw in, and just added and tasted until it was “just right.” I encourage you to do the same, as my love for bright lemon and spicy ginger may not be the same as your taste. I realize that the soba noodles are served cold, but the lovely acid tones of the dish go so well with the spicy tofu on such a dreary, November day. Even Roo, who has been adamant about hating tofu, slurped up the noodles with the red pepper flake and sesame oil infused fried bean curd. I hope that you will give it a chance as well. Fill your large pot three quarters of the way with water. Place over a burner on high heat. Make the sauce for the soba while you wait for the water to boil. In a small sized mixing bowl, add the olive oil, sesame oil, mirin, sugar, fine sea salt, rice wine vinegar, lemon zest and grated ginger. Whisk the ingredients together till well combined. Taste. I like this sauce full of punch from the lemon and ginger. Too tart? Add more sugar. Too acidic? Add a bit more olive oil. Make this sauce yours. Set aside. In another small sized mixing bowl add the sesame oil, soy sauce, red pepper flake, sugar and green onion. Whisk the ingredients till well combined. Set aside. By now hopefully the water has come to a boil. Add the soba noodles and cook. When done (I like them to have the same consistency as pasta), drain and rinse the noodles in cold water until the noodles are cold. Drain again and set aside. Pour the olive oil into a large saute pan and place on a burner over medium heat. While the oil is warming, remove the tofu from its container and rinse under cold water. Pat the tofu dry with paper towels. Cut the tofu into about quarter inch pieces. For instance, cut the tofu in half, down the long ways. Then, cut one of the halves again in half, down the short way. Then cut that half into four pieces. Repeat with the other half (and quarter) of tofu. I got 16 slices. If you get more or less, it’s ok! Cook the tofu on low heat for about five minutes, until the side facing the pan gets golden brown. 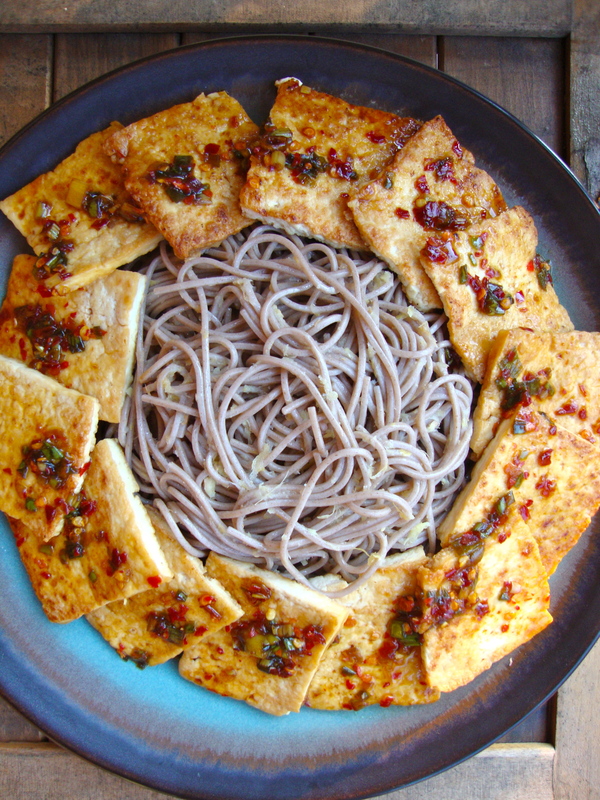 While the tofu is cooking, take your soba noodles and put them on your serving plate. Pour the half the soba sauce over the noodles. Toss the noodles with your tongs. Taste. Does it need more? Add more sauce. Set aside. Hopefully by now the tofu is golden brown on the side facing down on the pan. 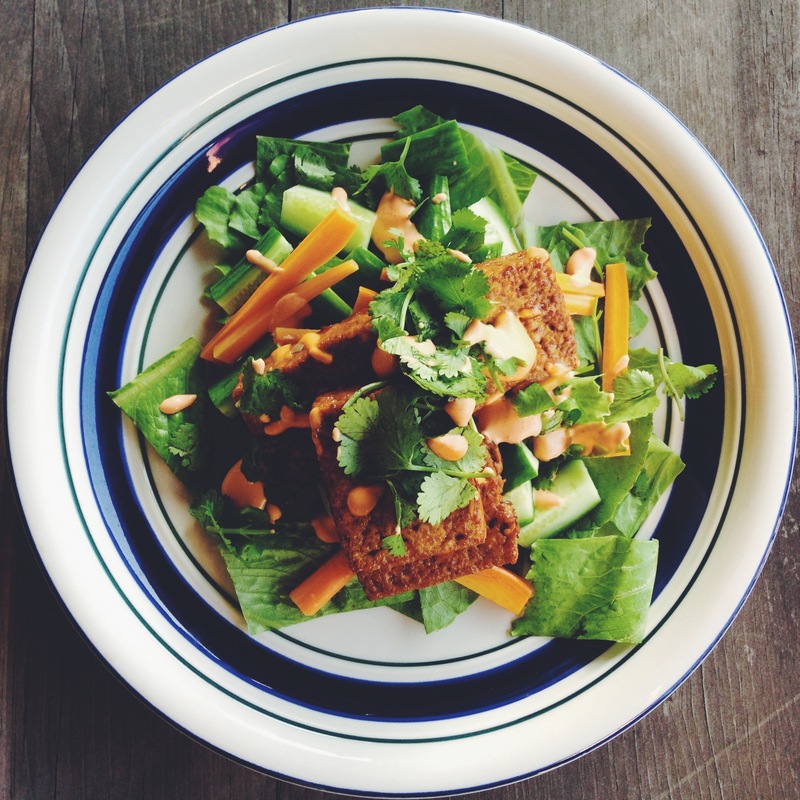 Flip all pieces of tofu over with tongs, a fork, chopsticks, whatever. Cook the tofu for about another five minutes. 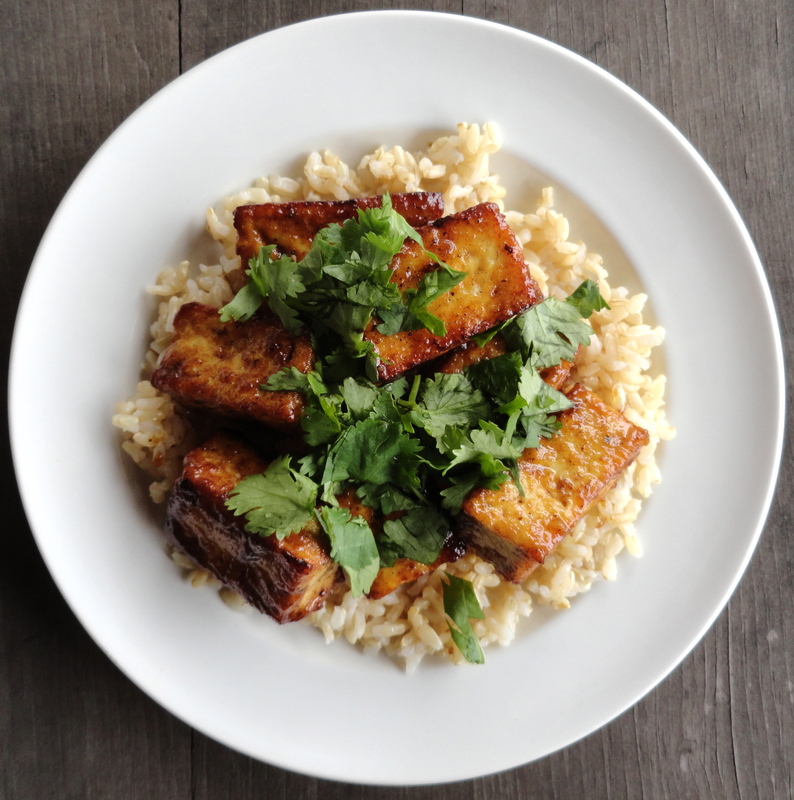 When the tofu is golden brown on both sides, plate it and pour the sauce over the tofu. Serve with the soba noodles immediately.